Those who know me know that I am a big fan of library e-books. I started reading them on my Nook Color and have since graduated to the iPad. For popular books, you have to get on a waiting list for an electronic copy. You get an email when you’re up and the book is available for download to your device. 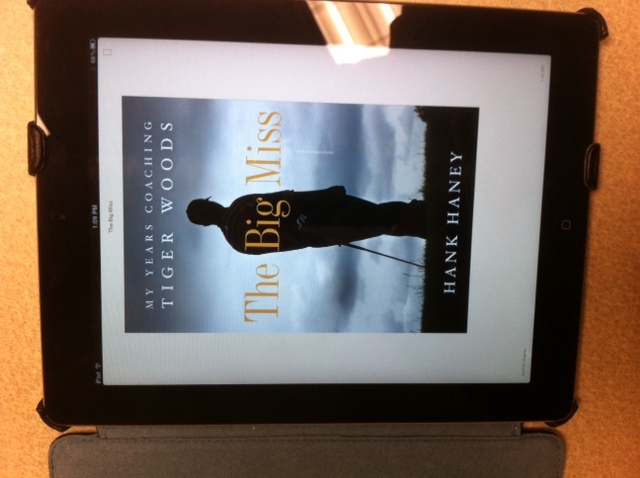 I will admit I was slow to the draw on the Hank Haney book and didn’t get on the list prior to release. Hence, I just got the email today. It has been downloaded and I have 21 days to read it before it vanishes from my iPad. I can’t imagine it will take that long to read this. Knowing it was only a matter of time until I was able to read it, I’ve tried hard to avoid most of the reviews and chatter about The Big Miss. I wouldn’t say that I have an open mind about Tiger — I certainly have an opinion — but I have an open mind about the book. I’m looking forward at taking a peek into Tiger’s inner circle.